Summer is over, which means road trip and camping seasons are unfortunately over as well. If you have an RV, it probably got a lot of good use this summer, but now it’s time to think about storing it. Much like you need to winterize your home or car in preparation for the upcoming cold months, you need to take steps to prepare your RV for winter storage. Defrost the freezer compartment and clean the refrigerator. Leave the doors open and place baking soda in the compartments to absorb any odors. If the RV is in long-term storage and won’t be plugged into electricity, it’s a good idea to turn off the main breaker in the power distribution panel. Close the window blinds to avoid sun exposure to the carpet, drapes and upholstery. Leave doors drawers and cabinets open. If you have vent covers installed on the overhead vents, that prevent rain from getting inside, leave them cracked open to allow for some ventilation. Remove any dry cell batteries from devices like smoke alarms, clocks etc. Wash the RV’s entire exterior, including the roof. When you are cleaning the RV exterior, inspect all roof seams, body seams and window sealants for any cracks and openings that would allow water to get in. Clean the awning fabric and let it dry completely before storing it. Store your RV in a covered area and on a solid surface like concrete or pavement. 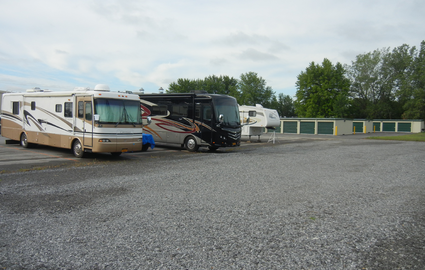 If you’ve got your RV winterized and ready for storage but have nowhere to put it, come to Clarence Secure Storage! We have a variety of spacious RV units that can hold your RV and keep it safe until it’s time to bring it out again. Call us at 716-407-6840 or visit our website for more information!